“a Lamp to my feet. a Light for my path.” – Luke 2:51 | A LAMP TO MY FEET. A LIGHT FOR MY PATH. Jesus’ mother treasured all these things in her heart. As Mary pondered all she had learned from reading and from what she had heard and seen, she so greatly increased in faith, advanced in merit and become enlightened with wisdom! She was also, more and more consumed with burning love; she was filled with joy; she became alive with the Spirit; she was guided towards God and was kept humble in herself. These are the effects of divine grace – they raise us from the depths to the heights, and increasingly and wonderfully transform us. Through the direction of the Spirit dwelling in her, Mary always obeyed the command of the Word of God…in all things. She was directed not by her own judgement or opinions, but she outwardly performed whatever wisdom had indicated inwardly to her faith. 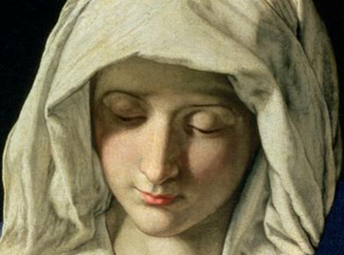 Imitate the Blessed Virgin, O faithful soul. Enter into the temple of your heart that you may be purified in spirit and cleansed of the pollution of your sins. In everything we do God considers our disposition rather than our actions. Whether in prayer and contemplation, or intent on being of service to those around us, our objective must be that we are motivated only by love of Christ. heavenly mother of mine, pray for me. and to treasure His words and actions in my heart. so that I may be made worthy of the promises of Christ.